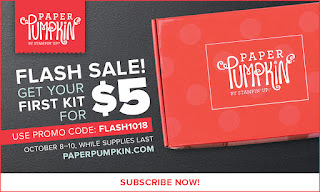 Sunflower Stamper: Paper Pumpkin Flash Sale! Starting today, October 8, WHILE SUPPIES LAST, or until the close for the October kit, 11:59 pm MT October 10, use the code FLASH1018 and get your first kit for JUST $5!! Click HERE for My Paper Pumpkin Site to Sign up!! Insider tip: Colors for the October kit will include Cajun Craze, Coastal Cabana, Fresh Fig, Grapefruit Grove and Night of Navy!! Contact me if any questions! !